Those of you in NYC will have a rare chance to see Wizard People, Dear Reader performed LIVE next week at Anthology Film Archives. (If you're not familiar with the movie, see Daniel Radosh's article on Salon.com.) 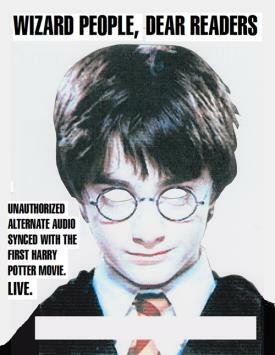 Brad Neely will be here in-person, narrating the story, which is based on the first Harry Potter movie. For those of you not in NYC, I'm hoping to get a BitTorrent of the audio files working again soon on the Illegal Art Exhibit site so you can download and watch it in the comfort of your own home. For those who want to give us money, you can buy our Wizard People CD package instead. I saw this live in Austin last year. It's an amazing and rib-hurting experience. Go!